Description: Get ready to be re-deployed for the sequel to the critically acclaimed and multi award-winning Company of Heroes. It is 1941 and the beginning of what will become the most brutal conflict of World War II, as Germany launches a full-scale invasion of the frozen tundra of the Soviet Union which would result in over 14 million military casualties. Take command of the iconic Soviet Red Army in brutal frontline warfare to free Mother Russia from the invading Nazis. Your strategic skills and tactical expertise hold the power to tip the very balance of this conflict. Engage in visceral tactical combat that will define you as a military leader and challenge you to wield the might of the Soviet Empire as you smash your way to Berlin. Award Winning Franchise ? The highest rated strategy game of all time returns with an innovative new warfare experience that will leave competitor?s out cold. Essence 3.0 Engine ? Cutting-edge technology enhances the impact of deadly combat with the unprecedented TrueSight line of sight system and the ultrarealistic ColdTech dynamic weather technology. Strategy gaming will never be the same again. Blood and Snow ? 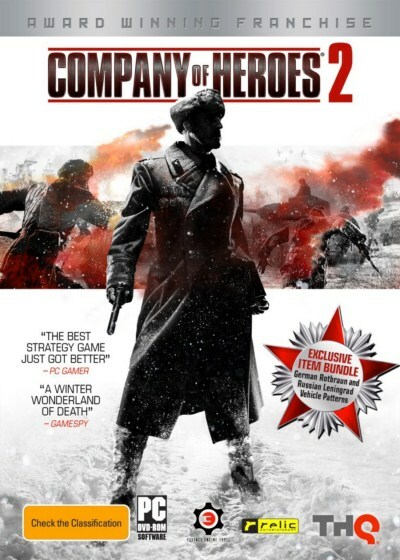 Take command of the iconic Red Army on the Eastern Front and repel the Nazi invaders in this Battle of the Ideologies. Tactical Warfare ? Develop and utilize your new Commander Abilities and experience the up-close moment-to-moment brutality of frontline warfare through new Dynamic Battle Tactics. Intense Online Combat ? Featuring the great competitive and co-operative multiplayer that fans have grown to expect from this high-quality and critically acclaimed.